Do you ever find yourself putting things off, delaying or postponing tasks? 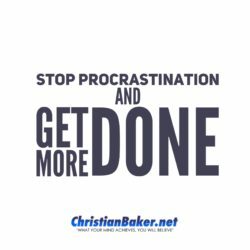 Then stayed tuned as I share with you 3 top tips to help you stop procrastinating and get more done! Procrastination is simply the unnecessary act of delaying or avoiding something, usually a task that needs to be accomplished! There are many different reasons why we procrastinate, and I’m pretty good at doing it myself, in this post I’m not going to delve into the reasons why, instead I’m going to share with you my top tips to help you overcome procrastination, get out of your own way and get more done! 1 – Clarity – One of the main reasons we find ourselves procrastinating is because of overwhelm, we often have so much to do, or that we want to accomplish where don’t know where to start for the best, so instead of getting started we find ourselves doing anything other than the main task and get nothing constructive done! The best way to help this, is to get clarity, take yourself through the 3 w’s get clear on where you don’t want to be, decide what you want and why you want it. Then you have a purpose and can start doing everything on purpose. 2 – Focus – gaining clarity will help with this, but you can also maintain your focus and momentum by asking yourself better quality questions. For example – What’s the one best thing can I do today to move me closer to achieving my goal? 3 – Good Habits – Often when we procrastinate, we establish bad habits of taking part in displacement activities, consistently checking social media and emails, watching TV or Youtube, going to the fridge. Instead, the 3rd tip to help yourself overcome procrastination is do develop good, more empowering daily habits and rituals. Ask yourself better quality questions. Set goals and reflect and review them daily. Journal – highlight and celebrate your wins and accomplishments. Daily downtime – to relax and unwind to help you be more productive. I hope you’ve found these tips beneficial, feel free to click here and leave a comment letting me know your favourite way to overcome procrastination. And before you go, please click subscribe and subscribe to my channel to get all future episodes.